I was trading licks and stories with my dear friend and blues brother, Reverend Robert Jones of Detroit, at the Fox River Folk and Storytelling Festival in Geneva IL over Labor Day weekend. He asked about some Lonnie Johnson licks. We didn’t have time to really explore them together and I promised him a short video. Here it is. Skype guitar lessons can be arranged by contacting me at scott (at) CattailMusic.com. 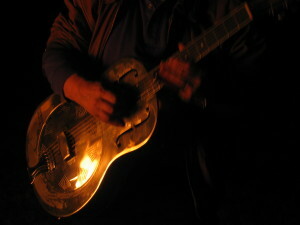 I’ve spent forty-seven years traveling with guitars and working with people who travel with instruments. I’ve had near catastrophes and witnessed many more. There are things that are obvious to me, that may not be obvious to, um…civilians. I offer these only to be thorough and useful. I’m not assuming you don’t know them. I’m just thinking about preventable disasters and how, if I didn’t mention a few of these, what a bone head I would feel like after something bad happened. I’m an Ainslie. We’re all like this. If you leave it unattended in car (or any public place), even for a minute, someone will kidnap it. If you leave it in a hot car, it will die. I don’t know why people like black guitar cases, but they are powerful solar collectors. Be careful of the sun. Never put the instrument down behind a vehicle. You will back over it. When you’re loading up, put it next to the front or back wheel on the driver’s side. Nowhere else. You will be sorry. It’s only a matter of time and distraction. When I’m on the road, every day is Take-A-Guitar-To-Lunch-Day. If the other people didn’t get the memo, their guitars are the ones being stolen out of their vehicles in the parking lot. We put the instrument down. …On a bed, a couch, leaning up against a chair, in a corner, on a table, or in an unlatched case. The case, which is the best of these options when you go to put the instrument down, will only keep it safe if you close the top and throw at least one latch, even if you’re only putting it down for a minute. Reread the previous sentence. Make a habit. Then you won’t have to look at me guiltily later. We’ll all be happier. …you or someone else will grab the handle of the case, thinking it is latched, and pick it up. This will open the case lid and toss your guitar onto the latches, and thence, the floor. Travel with your instrument, but don’t think of it as luggage, think of it as a dependent.